hiber | Which type of boiler do I need? So the time has come - the creaky old heater from another era in your cupboard has finally given up, and you need to replace it with something new. Or perhaps you’d like to upgrade to the latest, most efficient model. Whatever the reason for replacing your boiler, you’re probably thinking about important factors such as price, reliability and running costs. But the first thing to consider is the type of boiler that’s best for your property. Here, we outline the three main types of gas boiler on the market - Combi, System and Regular. (If you've got a non-gas boiler, such as oil or electric boilers, you’ll need a company that specialises in these - feel free to give hiber a call and we can make a recommendation). Combi boilers are not the best option for houses with very low mains pressure, as it doesn't change this pressure. If multiple people use hot water at once, you may need a high power combi, if your water pressure supports it. If your water pressure isn't sufficient for two showers at once, and you often require it, a system or regular boiler is the best choice. Combi boilers are the best option for around three-quarters of the UK’s households. However, for larger properties with 2 or more bathrooms or lots of rooms to heat, you might need a boiler with a hot water tank (System or Regular) - especially if there are multiple people in the house who want to shower or use hot water at the same time. 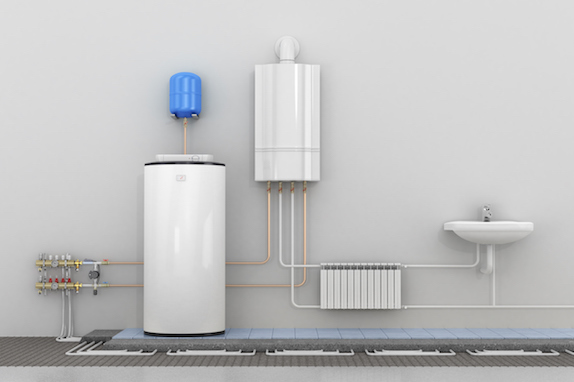 Both System and Regular boilers follow the more recognisable central heating design of a boiler plus hot water cylinder, usually in the airing cupboard. The cylinder ensures there’s a good store of hot water available, so lots of people can run showers and baths at once, all with great pressure. In a nutshell, the main difference between Regular and System boilers is that System boilers have key parts like the water pump and expansion vessel integrated into the boiler itself, while Regular boilers have these components as separate parts of your central heating system. This means System boilers are a little more expensive compared to Regular boilers, but make things a little more compact and are easier to install. Otherwise, they're quite similar in terms of design. A big home may need higher flow to get hot water flowing throughout the house efficiently. This can place excessive demand on a combi boiler, while a separate hot water tank lets water flow on demand, at the same pressure, letting multiple people use hot water at once without issue. For Regular and System Boilers, there is one other choice that has a big impact on the performance of your central heating system - your cylinder. There are two types of cylinders to choose from - open-vented (relying on gravity for water pressure) and unvented (a sealed system with better hot water pressure). This is determined by the type of hot water cylinder you have - you can upgrade from a vented to unvented system for better performance. Open-vented central heating systems are the most common - they have a cold water tank in the loft, and rely on gravity to push water around the house. This is better for older systems that may be vulnerable to high system pressure, avoiding leaks in older radiators. Open vented systems tend to be less expensive. Unvented central heating systems are a closed system not open to the air, and therefore maintain the mains water pressure. The advantage is no cold water tank in the loft, and improved pressure in the system. This means better shower and hot water pressure compared to vented systems (where pressure is based on gravity). If you don't have one of these already, you'll need a new unvented tank like a Megaflo to turn your system into an unvented one. So...which boiler should I choose? We find small to medium houses typically are best off with a combi, while larger homes are best with a System or Regular Boiler, particularly if there are more bathrooms. Replacing your boiler with a like-for-like swap is usually the most economical in terms of installation - for example, replacing your combi, or using your existing Vented cylinder and just replacing the regular boiler. If you have a regular system, for the best performance, consider switching to a combi or unvented set-up, depending on your needs. The guidelines above should help, but for medium sized properties (such as a 4 bed 2 bathroom home) it becomes a little more of an art than a science. The best choice will be influenced by the short and long term cost, the age of your existing system components and your mains water pressure, for example. Speak to a good installer who understands the mix of factors that determine the best type of boiler for your home, and be sure to explore your options before you decide. We're happy to provide no-obligation advice on the best options for your home - just get in touch below or drop us a line on 0808 169 6484.